For a number of years now, tobacco has been used to spice up the menus of some of the world’s most elite restaurants. DON’T JUDGE A CIGAR BY ITS COVER! Each cigar offers a unique taste. And while the wrapper contributes, it does not really determine the flavor. what’s she need? strength, personality & looks! 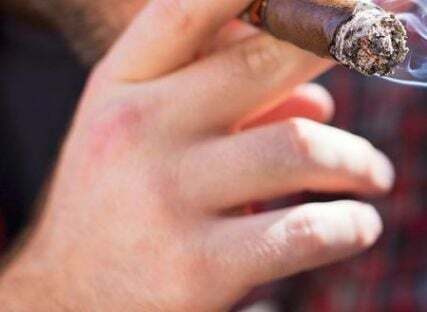 The cigar of your dreams should have all three of these major character traits. impeccably dressed . . .
A flawless wrapper leaf is key to creating the ideal “public face” for every cigar. Some fine cigars (such as our Ortega Serie ‘D’ Maduro this month) sport an unusual square, not round shape. Cigar rollers in Cuba in the 19th century were well-versed in the classics, because many factories employed cigar factory readers. where there’s smokin’, there’s fire! A cigar is lit by drawing the heat of a flame through the body of the tobacco. Unavoidably, along with the flame are drawn the not-so-great by-produts of that fire. It’s strictly a matter of preference, but the most popular beverages to pair with cigars are cognac and brandy.